Eggplant Automation Cloud is a reservation system used to facilitate controlled remote access to a centralized pool of systems under test (SUTs). This pool can include mobile devices, physical machines, and virtual machines. Eggplant Automation Cloud can be used to ensure that your testers always have access to the SUTs they need and that test systems are always in a clean, known state. Using Eggplant Automation Cloud removes the overhead of managing a large number of systems. The installer for Eggplant Automation Cloud is the same installer used for Eggplant Manager; your license determines the features you can use. For more information on getting Eggplant Automation Cloud up and running, see Eggplant Automation Cloud Installation. Your testing team will use Eggplant Functional or a browser interface to make reservations through the Eggplant Automation Cloud server. 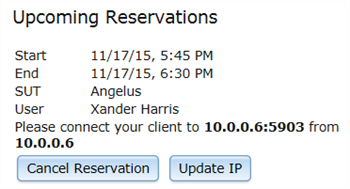 Testers can make reservations in advance or reserve systems at the time they are needed, provided SUTs are available. The server then manages the SUT connections so that different testers don't connect to the same SUTs at the same time, and it provides platform specifics so testers know what they are connecting to. The connections to SUTs are made directly from Eggplant Functional. If the Eggplant Automation Cloud server receives two requests for the same type of SUT, it will provide different SUTs of that type, if such devices are available. A tester makes a reservation through the browser or through Eggplant Functional, typically requesting access to a specific type of SUT, such as a Samsung Galaxy S5 running Kit Kat. At the reserved time, the tester uses Eggplant Functional to request a connection; Eggplant Functional communicates with the Eggplant Automation Cloud server and requests access to the reserved SUT. The Eggplant Automation Cloud server provides the connection so that Eggplant Functional can connect to the SUT in the same way that it does without Eggplant Automation Cloud. If another tester requests access to a Samsung Galaxy S5, Eggplant Automation Cloud provides a connection to a different Samsung Galaxy S5 than it did for the first user, provided one is available; if no other SUT of the requested type is available, the second user is unable to connect at this time. Note: Best practice is to place all the SUTs you intend to use with Eggplant Automation Cloud on a private subnet with the Eggplant Automation Cloud server as the only access point. However, there's no requirement that you use such a configuration. Work with your network administrator to establish the network configuration that's appropriate for your environment. You can connect to SUTs in Eggplant Automation Cloud with other testing tools, such as Selenium or Appium. Create a reservation in Eggplant Automation Cloud , then connect to that SUT from your chosen tool. Instead of entering the IP address and TCP/IP port of the SUT or test device, enter the IP address of the Eggplant Automation Cloud server, and a port assigned by Eggplant Automation Cloud. For example, using the Eggplant Automation Cloud reservation shown below, the tester would tell Selenium or Appium to connect on IP address 10.0.0.6, port 5903. Because Eggplant Automation Cloud only forwards TCP/IP connections, and does not interact with the test data stream, connecting through Eggplant Automation Cloud does not require any changes to your existing test framework. There is no additional software required on the test client, the SUT, or mobile device. Eggplant Automation Cloud is fully integrated with Eggplant Manager, Eggplant's test management system. Eggplant Manager requires a separate license, but if you are running both, you will be able to manage your tests and control access to your testing environment in a single interface. It's also possible to run Eggplant Automation Cloud without Eggplant Manager. For complete information about Eggplant Manager, see Eggplant Manager.